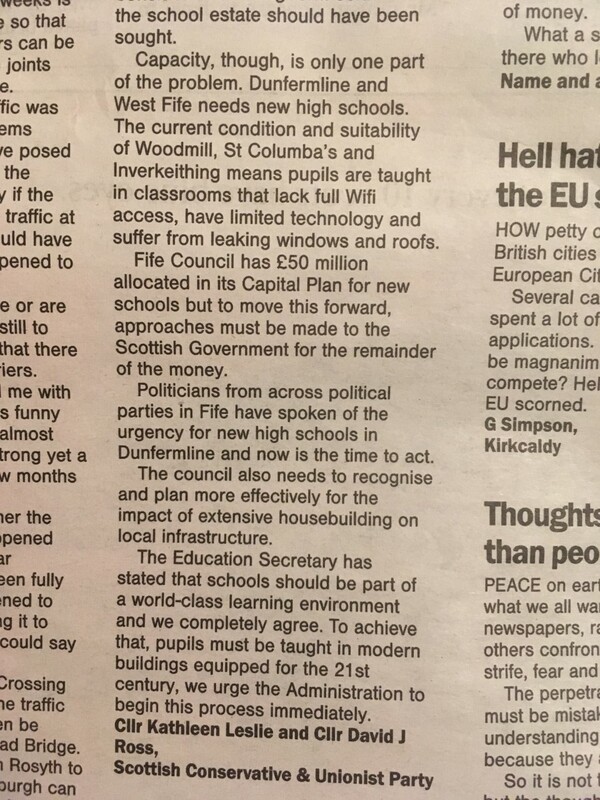 Fife Conservative Councillors, Kathleen Leslie & David J Ross are bringing a Motion to full Council this Thursday asking the Administration to address the need for new high schools in Dunfermline and West Fife. Cllr Leslie said: “Before the local elections both Labour and the SNP spoke out and indeed blamed each other for not addressing the need for new high schools. Now we are hearing a deafening silence. Woodmill has a looming capacity crisis and all three schools are listed as category C in condition – this means that the school estate itself is considered to be ‘poor and showing major defects’”. The Motion before Council on Thursday asks for a full report on all options for three new high schools in Dunfermline and West Fife, and in addition quarterly updates on the status of each option. “There have been available funding streams in the past for new high schools, including Dunfermline and Queen Anne High School whilst the new Levenmouth Academy received £23 million in Scottish Government funding. The Education Secretary has spoken of the need for young people to be educated in world class schools. Now is the time for Fife Council’s Administration to begin that process in Dunfermline and West Fife,” stated Cllr Leslie. This week Fife Councillors will come together for the final Full Council meeting of 2017. For a new Councillor like myself, the past few months have been a huge learning curve - something I want to talk about but I will keep that for a later post. On Thursday I will put a Motion to full Council asking for the status of the school estate in Dunfermline & West Fife to be addressed. In that I refer to the need for three new high schools in the Dunfermline area. This is a long running issue and one in which I have spoken of on previous occasions on this site and in correspondence to local media. 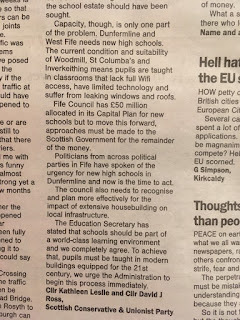 I made the decision to bring this to the final meeting of the year as it has become my belief that whilst the Administration do want to address the need for new schools in Dunfermline and West Fife, now that they are in a shared administration the calls of the urgency for this (along with the endless SNP/Labour "lets blame each other for nothing progressing on the school estate") have gone silent. Labour can no longer shift the blame to the Scottish Government now they are in the pocket of the SNP in Fife and the SNP can no longer shout that a Labour Administration in Fife is hopeless/useless/inept as they are their partners. Whilst the silence has deafened us all I have continued to push the question, whether it be on here, in the media or tacitly at the committee level where I have seen an opportunity to mention it. Last Thursday the Dunfermline Press headline read that Woodmill High School would now be potentially 70 pupils over capacity and that pupils would find out where they would be placed almost through a lottery. I absolutely stand by my decision to support the proposed amendments to rezoning - which as a result has pushed all rezoning back by a year. A longer more thought out approach is required, one which will come back to Committee in the new year. 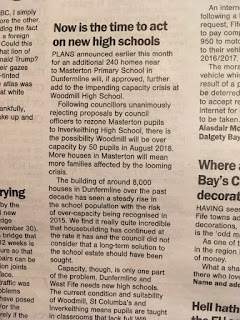 Myself and Cllr David J Ross had a letter featured in the same copy of the Dunfermline Press where we pressed the case for new schools - capacity and catchment is only one part of this argument - which I will be discussing further on Thursday but we also have to address the need for a school estate fit for the 21st century. "Now is the time to act on new high schools"
Capacity though is only one part of the problem. 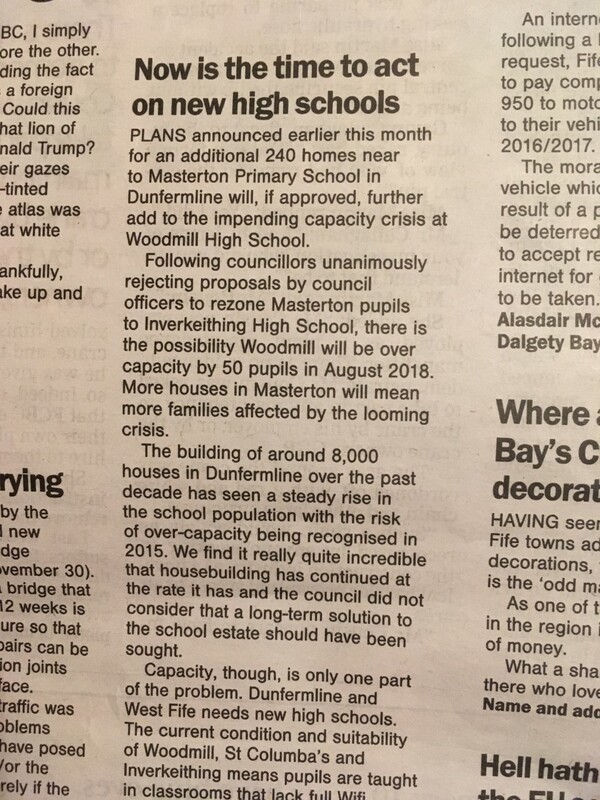 Dunfermline and West Fife needs new high schools. 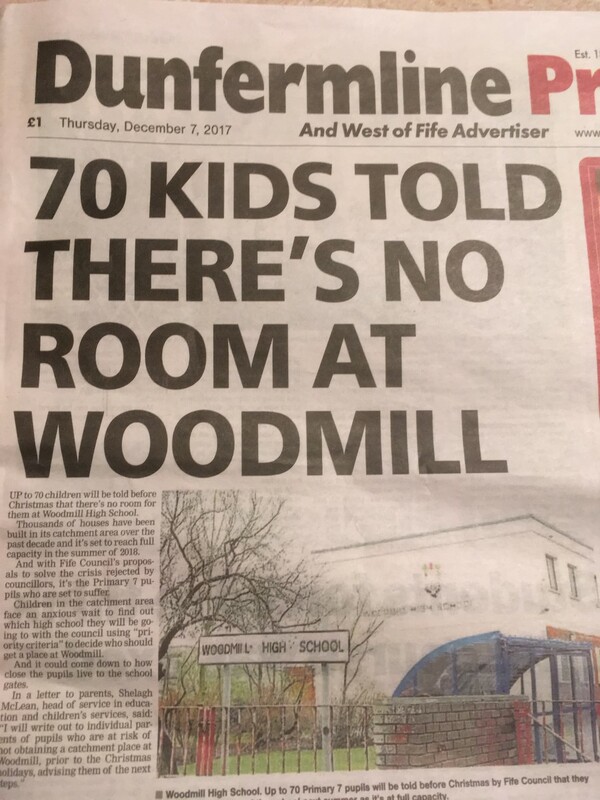 The current condition and suitability of Woodmill, St Columba’s and Inverkeithing means pupils are taught in classrooms that lack full Wifi access, have limited technology and suffer from leaking windows and roofs. Fife Council has £50 million allocated in its Capital Plan for new schools, but to move this forward, approaches must be made to the Scottish Government for the remainder of the money. The Education Secretary has stated that schools should be part of a world class learning environment, and we completely agree. To achieve that pupils must be taught in modern buildings equipped for the 21st century, we urge the Administration to begin this process immediately."